Great Britain triumphed against Samoa in one of the three early classification matches at Royal Park last Friday. The day saw each country compete to decide their final finishing positions at the 2008 International Cup; in this case ninth and tenth spots. Ironically three years earlier at the previous tournament Samoa beat Great Britain to clinch fifth spot. Whilst both countries have suffered a slide down the ladder, if anyone needed convincing that the standard of play has improved, this British side was arguably better than their previous two, and they played a Samoan team minus current World Team representative Fia Too-too (who returned to Samoa suddenly for family reasons) and many of their Australian-based players from previous International Cups. As two of the freshest teams at the International Cup, India's Tigers and China's Red Demons both faced a huge learning curve on the field. When they faced off at Royal Park on Friday, it was a strong contest between two sides who had improved immensely over the past two weeks. Some inaccuracy in front of goal by the Chinese saw the Indians with a two-point break at quarter time, but from then on the Red Demons got their noses in front and kept a slight advantage over the Tigers for the remainder of the game, eventually finishing with a jubilant 14-point win, their first-ever in International Footy. A tired and battered Finnish side fought bravely to the end on Friday, with almost the entire squad either injured, battling the flu, or both. With the bare minimum 18 on the field, the Icebreakers ended their first International Cup campaign with a 12-goal loss to the Peace Team, but never gave up. The Peace Team were also looking battered, with broken noses, sore knees and strapped shoulders, but the mood in Dipper's camp was extremely buoyant right from the opening bounce, with a few new fans making the trip up from Warrnambool and plenty of noise and smiles from the first middle-eastern squad to appear at an International Cup. 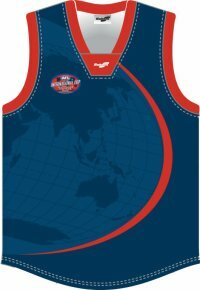 The AFL has once again named a World Team from the sides competing at the AFL International Cup. The players were announced at the Official Dinner at the Palladium at Crown on Thursday night, with players presented with their jumpers. Unlike previous "team of the tournament" type awards, the players selected were placed in playing positions, and it was accepted that some of the lower ranked sides would be without representatives. Samoa's Fia Too-too was named on the half-back flank, making it a remarkable three from three. Unfortunately he had already returned home to Samoa for family reasons (a birthday) so was not present for the team photo. The World Team, in positions, is shown below. With the Grand Final completed we can now reveal the final finishing positions for the 2008 Australian Football International Cup. Match reports for the final round games will follow over the next couple of days. Here are some brief thoughts on the final rankings. Papua New Guinea's Mosquitoes have finally broken through to win the International Cup at the MCG after twice being runners-up. It was magnificent come from behind win against quality opposition, the New Zealand Falcons, in a high quality match. The game started a few minutes earlier than expected, with New Zealand kicking to the Punt Road end but with little advantage from the gentle breeze. The game quickly settled into the pattern of play anticipated - the Mozzies attacking at all costs with pace and carry but the Kiwis holding them up with superior height then using the ball well going forward. The New Zealanders kept their structures and made space for their forwards to run into. Everything was falling into place as Moss Doran goaled from a mark, captain Andrew Congalton roved the pack for another major, and James Monaghan converted from a free. The Papuans had less genuine chances and to make matters worse squandered them with only four behinds to show for the first quarter. NZ 3.1 (19) to PNG 0.4 (4). 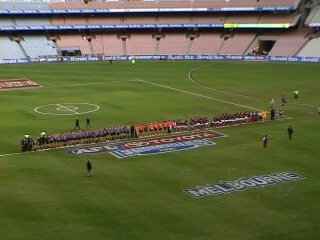 First pictures from the MCG Grand Final of the 2008 Australian Football International Cup. Game still in progress. More to follow later. 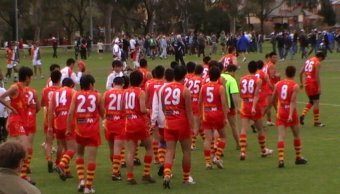 This article is being updated each time there is a score in the 2008 Australian Football International Cup, Friday 5th September 2008, between New Zealand and Papua New Guinea. Note there are some anomalies between the players we noted and the AFL's final results - we'll follow that up and make any necessary corrections (e.g. sometimes jumper numbers are belatedly changed if damaged). The intention is to update these scores each quarter as the games progress. Match reports and images will follow later. All times are Australian Eastern Standard Time (AEST), which is +10 GMT. A cloudy day around 18 degrees Celsius, occasional showers predicted but did not eventuate. 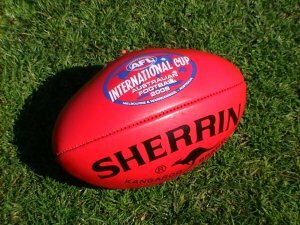 The tournament concludes with the Grand Final tonight, 5:10pm Friday 5th September, at the MCG when New Zealand play Papua New Guinea, immediately preceding the final between Hawthorn and the Western Bulldogs. 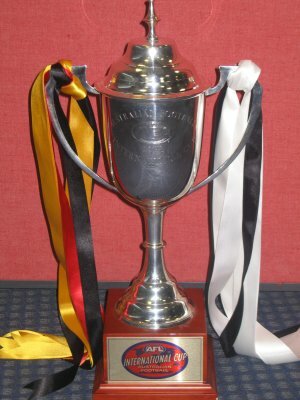 The 2008 Australian Football International Cup draws to a close on Friday night with what should be an epic contest at the MCG from 5:10pm between New Zealand and Papua New Guinea as a curtain-raiser to the Hawks versus Bulldogs AFL final. 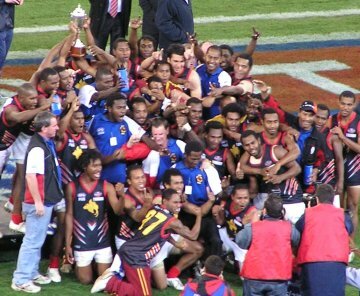 These proud teams contested the 2005 Cup, with the Falcons just a few goals too strong for PNG. That match was all about New Zealand's structured footy against the Mozzies' run and evasion. This clash could be seen the same way, but the Kiwis have added more run and carry themselves, now having a more complete game. For their part the Papuans seem to have found a few taller forwards who, though young, offer promise and the occasional mark from a get out of trouble long kick. In their respective semi-finals in Warrnambool both were impressive. The Papuans were, remarkably, too quick for the pacy South Africans. Their superior body strength saw them break too many tackles and slowly pull away to a good win. The scoreline between New Zealand and Ireland was very similar, but came about very differently. The Kiwis were simply outstanding in the opening 15 minutes of the game, moving the ball with precision and passing to forwards leading into open space - it was over by quarter time and the rest of the match was just a formality as they held their ground. The 2008 Australian Football International Cup draws to a close on Friday 5th September with 7 games (and a Multicultural Challenge match) at Royal Park in Melbourne and then what should be a terrific battle at the MCG from 5:10pm between New Zealand and Papua New Guinea as a curtain-raiser to the Hawks versus Bulldogs AFL final. The Warrnambool first round finals matches went mostly as predicted and have set the scene for 8 very tight battles. First up in the 10am slot at Royal Park's Western Oval is Finland versus the Peace Team. Both had their first wins in Warrnambool and will play off for 13th and 14th positions. The Finns should be too accomplished, assuming they can find enough fit men given their squad is down to its last numbers. The Peace Team will attack them with renewed enthusiasm and do pose a serious threat. Finland by 12 points. The China v Peace Team match up looked to be a toss of the coin as to who might come out on top going from form on previous games, with the Peace Team perhaps being slight favourites. Both teams looked battered and bruised but full of spirit as they ran out onto Mack Oval in Warrnambool, mostly because they knew their opportunity for victory had come. China went in without forward Liu Ming, ruckman Gao Rundong and pacy onballer Gao Lei, giving those that stepped up the chance to be in their country’s first winning side. The game had been moved to an earlier time slot due to the Peace Team’s request so that their players who were in the midst of Ramadan would not be so affected by the dietary restrictions that must be followed.